Aside from World Cup mania, I’ve never been a huge football fan but if I had to pick one sport it would be the one I’d pick as I feel most familiar with it. The biggest sport in Japan is undoubtedly baseball and as that’s almost non-existent in Europe I know absolutely nothing about it, other than what my students tell me which is usually just “Ichiro is cool” and “baseball makes me fun”. Anyway, I digress… this post is about football. Japan League football specifically (or soccer, if you prefer). Recently Gav and I decided we’d like to support a Japanese team and to decide, we followed to most obvious process and picked the team with the cutest mascot. 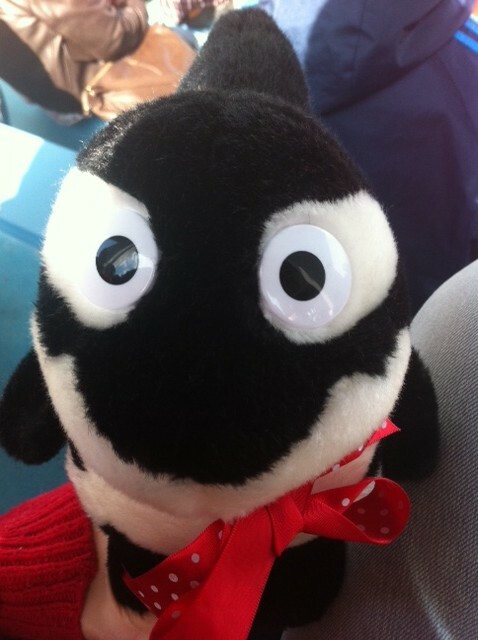 …winner of Eleanor and Gavin’s cutest football mascot 2013, meet Grampus-Kun, the friendly football loving killer whale. 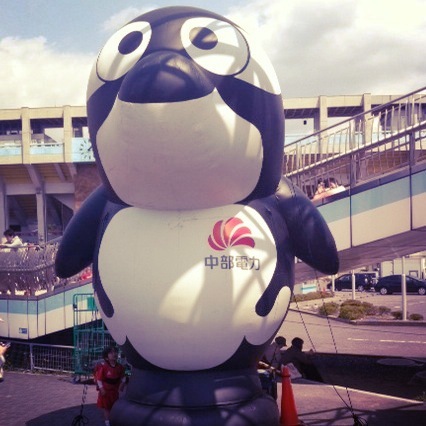 Grampus-Kun is the proud mascot for the mighty Nagoya Grampus and he comes at the top of many mascot polls, he’s just that cute. 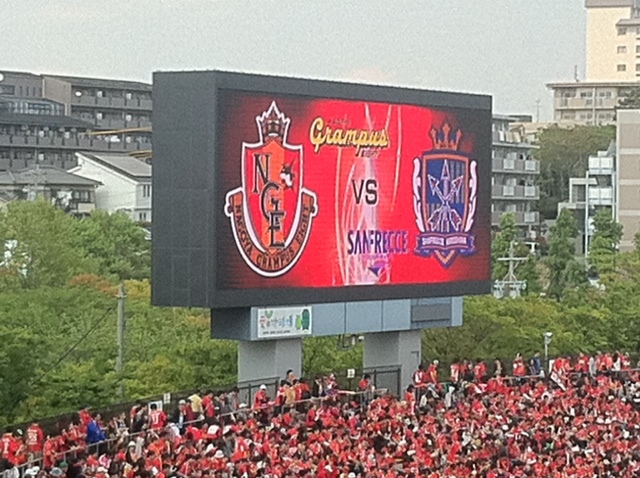 Nagoya Grampus hail from Nagoya (unsurprisingly) and they have two stadiums. One is a no-frills venue not far from the heart of Nagoya city and the other is a state of the art, huge, shiny stadium with a retractable roof. It’s not too far from Nagoya in the city of Toyota yes, that’s right, where they make the cars. Incidentally, Nagoya Grampus were originally formed as the company team for Toyota cars and the motor corporation also paid for the second stadium aptly named the Toyota Stadium. 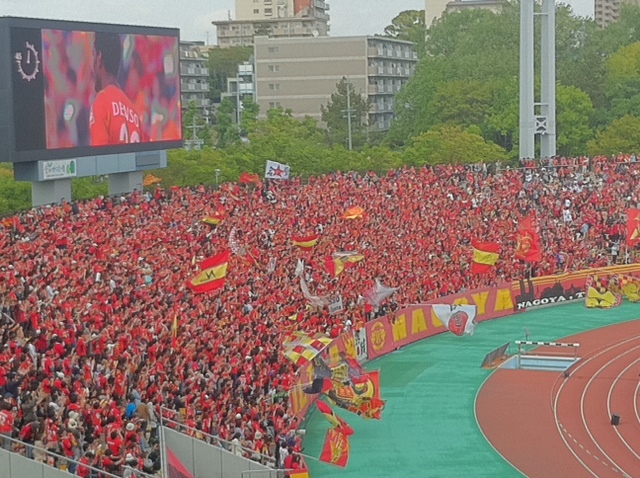 Admittedly we’ve only actually been to one Grampus game and that was a couple of months ago when they were playing current reigning champions Hiroshima. Getting into the spirit of things I donned my new red and yellow scarf and enthusiastically waved my plush Grampus-Kun around. Unfortunately it wasn’t a win for Grampus that day which resulted in loud boos from fans as the players did their final lap of the pitch. A little bit harsh – it was a draw after all. Feeling a little bit dejected, I was left thinking I’d chosen the wrong team but one look at Grampus-Kun clumsily bobbing around the pitch was enough to put a stop to my doubting mind – next time we’ll do better. The atmosphere at the game was superb and unlike back home it never felt like the crowd was going to turn sour or violent at any point, which is always a plus. On the west side of the pitch there was a standing area for diehard fans and they were pretty rowdy – as I sat on my concrete seat I feltrelieved that I wasn’t placed in amongst them. I might have to go to a few more matches until I’m ready for that. The only thing missing from my Japanese football experience was a pie and Bovril stand, somehow it didn’t feel the same slurping noodles and chomping on onigiri rice balls whilst watching the match. Tickets for the game were 3,600yen which I felt was rather steep for a football match but as I’m not a seasoned football-goer I don’t have much to compare it to. It is a little bit more than I’d like to pay for 90 odd minutes of ups and downs, oohs and aahs. Seating with the die-hard fans is a little bit cheaper but with the catch that it’s standing only and I fear I’d be eaten alive for not knowing the songs. Even though Grampus didn’t win and even though the guy sitting next to me was eating a fishy pot noodle that smelled exactly like cat food, I still had a great time. I’m looking forward to following Grampus and hopefully in the future I can see plenty of wins! FIGHT!